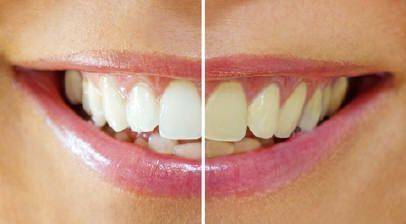 At Tangmere Dental Care we are proud to provide a full range of services and treatments. The clinicians are highly trained in all fields and keep well up to date with advances by attending regular courses and training. The practice has several highly specialised items of equipment to enable the practitioners to fulfill special interests in several advanced treatments normally only provided at specialist level and we can do this at a generally lower average cost. Not only do we offer general dentistry but we also take referrals from other dental practitioners for the more advanced services we offer. Whilst we undertake all aspects of dental care if treatments are really complex we have a referral path to specialist dentists locally. To enable more complex work to be completed within the practice we also have an internal referral system to clinicians with the best skill set appropriate to you. This enables us to focus on quality at all levels of care and also offer real value for money. The most important field that we have a special interest in is in diagnosis, prediction, and prevention of dental disease. This is an area where we set the bar very high, to make it much more likely that even individuals that are constantly prone to the disease and repair style of dentistry can control and reverse this trend and so make it more likely to keep teeth into older age. This is so important that we have given this a special section of its own. Refer to the Maintenance of health tab. (Also if you are nervous or phobic of dental treatment this will be of special interest to you and something we can help with). Grossly worn front teeth built up with simple white filling material as the first phase in rehabilitation of tooth structure. This patient has had these for over 5 years now without conversion to crowns as he is happy with the result seen. 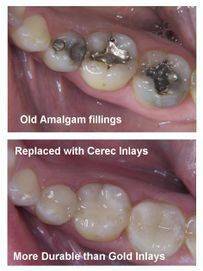 Old Amalgam fillings replaced with Cerec Inlays. Inlays are the equivalent of fillings in solid ceramic. They are the safest most durable repair available today. 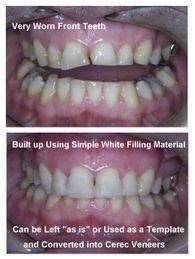 Significantly more durable than a standard filling or even crowns. 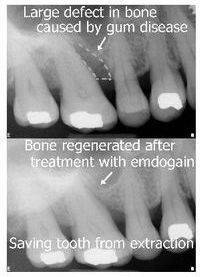 Periodontal Surgery using Emdogain to regenerate bone in a bone defect below gum level caused by gum disease. 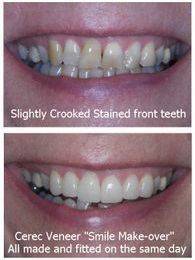 Without this successful treatment, the tooth would have been lost and an expensive bridge or implant being the only real option to replace the tooth. Smile Make-over completed using Cerec veneers. These were made and fitted all in one day without any impressions or temporaries. 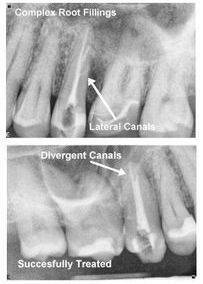 Endodontics commonly known as root fillings. This is technically the most difficult specialty in dentistry and needs to be done well first time. The fine tubes or canals inside the root where the pulp of the tooth is, needs to be properly cleaned and filled if diseased. If not infection can be left behind and unblocking the canal again may be impossible. Whilst we always recommend saving a natural tooth where possible as only natural teeth can last a lifetime, occasionally people attend too late or have already lost teeth. In this case it is always best to replace a tooth with an Implant as this does not involve affecting neighbouring teeth. Also, people that have been struggling with dentures can benefit as securing a denture with Implants really helps fix a removable plate making them more tolerable. At Tangmere the Implant surgeon has been replacing teeth successfully for over 10years now. We only use recognised and reliable implant systems that have stood the test of time. We will only recommend implants if the situation is suitable as unfortunately there are several circumstances where implants are likely to fail or cause harm. If there are any diseased teeth still in the mouth this will spread to the implants. If there are vital structures (nerves and blood vessels) or air spaces (nose and sinuses) with insufficient bone in-between there may not be room for the implant.